A creative environment that promotes learning through exploration and discovery. The kindergarten (5/6s) program encourages children to learn through experiences. Our child-centered curriculum introduces concepts in mathematics and literacy while focusing on core themes like community and culture. The formative year of kindergarten offers children a strong foundation in how to relate to the people, materials, and environment within their school community. Young learners begin to expand their worldview and discover how to interact with others in a shared space. Social and emotional development is an important focus of our curriculum. Children are encouraged to think about concepts like fairness and equality through their interactions with one another. An appreciation of different cultures is woven into everyday learning, in music, stories, and class discussion. 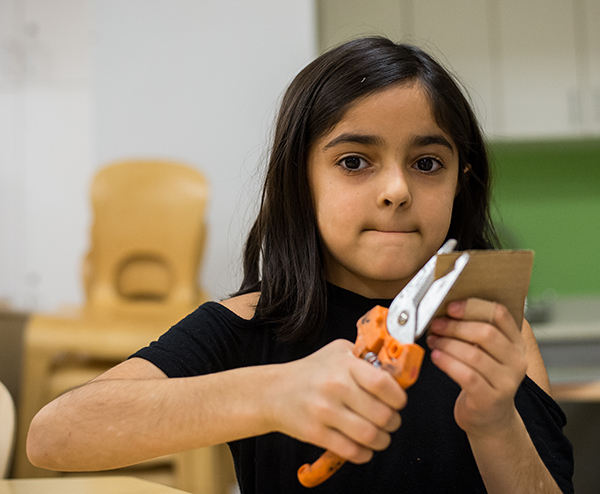 Our curriculum encourages children to ask why, to form connections, and to pursue their interests. We embrace each child’s unique way of thinking and recognize that children learn by both exploring and observing their environments. Instruction is tailored to individual interests and abilities, so children start their academic journey with confidence. Our curriculum begins to hone its focus on literacy skills beginning in the 5/6s program. Recognizing that there are many ways to support literacy development, each day includes language, reading, and writing activities. Children learn through classroom instruction and through real-time application. Lessons include foundational concepts like letters, syllables, words, and sentences and are enriched with rhymes, stories, games, and activities. Read-aloud stories are an essential part of each day. Children enjoy books from various genres and formats and are prompted to make connections with the characters or subjects. In the 5/6s, children are encouraged to begin handwriting, writing words as they sound. As they begin to learn to spell and write, the focus for this age group is for children to find motivation and feel encouraged to try. 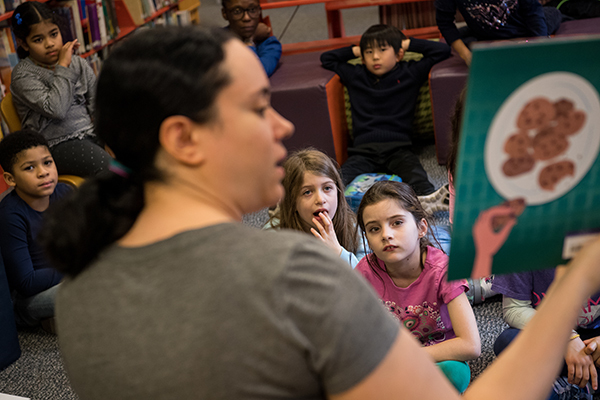 Kindergartners build their verbal and visual literacy skills and library utilization skills during their scheduled visits to the library with their teachers. During read-alouds with the librarian, 5/6s practice making meaning of a story by understanding the interplay of words and images–building a story arc, understanding character motivations, “filling in” words or concepts based on the pictures, etc. They also practice responding to the story by making predictions, evaluating characters’ feelings, etc. They build on similar skills learned in the 3/4s and 4/5, with progressively more complex words, sentences, and story structures. Our main goal in the 5/6s Spanish program is to is to expose the students to simple vocabulary and routine phrases. Our emphasis is placed on communication. We strive to develop our students’ receptive and expressive language. The teacher welcomes every effort made by the student to use and understand the language. We offer different strategies to help with understanding, such as gestures, prompts, and shorter sentences. We make sure to only use the target language around the students with minimal or no translation. The spirited energy of a group of 5- and 6-year-olds does not lend itself to sitting still. Fortunately, neither does our kindergarten math and science curriculum. Every day we seek to spark the inquisitive minds of the 5/6s through engaging, hands-on learning. We encourage children to ask questions and follow their curiosities as they begin to shape their own investigative processes. Activities might include studying the life cycle of a Monarch butterfly or cooking different types of eggs as an experiment. Children are taught to ask “why?” through a variety of subjects and experiences. You won’t find students in the kindergarten room sitting in silence completing math worksheets. Instead, a math lesson might arise from a simple question in morning meeting: “Who has fruit in their lunch today?” With the resulting data, the teacher might create a graph to visually represent the information. With a focus on experiential learning and critical thinking, our math and science curriculum is both student-focused and engaging. The 5/6s begin the year with a study of Monarch Butterflies. The Monarchs arrive in larvae form, almost too small to identify, and they immediately spark the inquiry process. 5/6s start to use the language of scientists predicting what the animals are and what will happen to them. As a class, the children discuss what it means to study something and how to go about doing it. From their ideas about the studying process, the class gathers books, observes closely with magnifying glasses and through drawing, and continues to gather information. While they learn about the life cycle of a monarch and how to care for their animals, the learning is not so much about the what as it is the how. The ideas they generate for how to study something serves as a foundation for further inquiry over the course of the year. Children will continue to question the world around them and look to the research elements they learn while studying the Monarchs to serve them in future endeavors. Whether the class is observing or caring for a classroom pet, planting on deck, or looking closely at our classroom composting system, they are following their curiosities and making use of the tools available to them throughout their investigative process. Lower School learners use audio technology to share stories and songs. Images and videos are available to address students’ needs, such as showing information about a destination for a student’s family trip. Teachers and students work together to create printed materials for student and class projects. Art in the 5/6s program is rooted in creative discovery and freedom of expression. Children grow and develop during weekly art instruction from our Art Specialist. 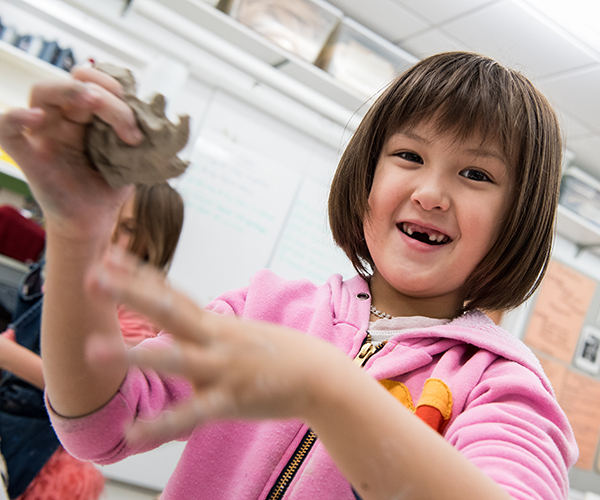 Throughout the year, children are encouraged to explore different materials, including collage, paint, and clay. In each lesson, the art teacher presents a “motivation”—a question designed to spark thinking about a certain material. For example, a teacher might ask “How can you combine these rectangles to make an animal?” as a motivation. 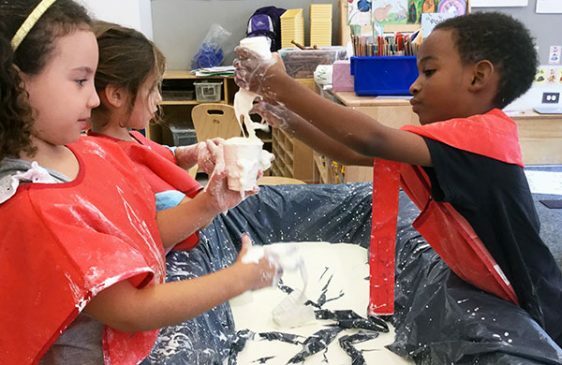 Learning about how materials work together and seeking answers promotes children’s growing ability to form connections within their world. 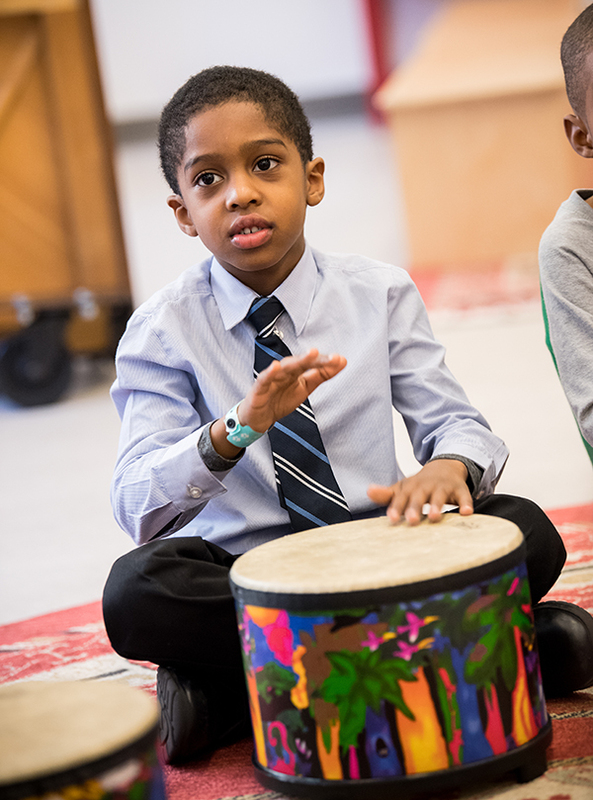 Bank Street’s Lower School music program introduces musical concepts and skills in a fun, engaging environment. Children are frequently exposed to music—in the classroom, at special events, and in formal music group settings. Children learn through making music, rather than simply learning about music. In the 5/6s classroom, children have access to a diverse assortment of drums and percussion instruments. We encourage group singing and rhythmic movement through activities like song-games and dance. Developmentally, many children in the 5/6s can create and imitate a steady beat. Classroom dance helps promote experimentation with rhythmic movements such as skipping, tiptoeing, galloping, leaping, and freezing. Music is embedded into weekly lessons and integrated with celebrations and special events such as our annual Hoedown each fall. Children learn essential cooperation skills by learning to dance and sing songs during seasonal festivities. The purpose of Movement classes in the 5/6’s is to facilitate creativity, imagination, risk-taking, and confidence through the exploration of movement concepts: space, time, and energy. Through movement, students integrate the brain and body, developing balance, coordination, and spatial awareness. In addition to movement concepts and awareness of body in space, our movement classes allow children to experience themselves as individual dancers, as partners, and as members of a group. In all of these formats, dancers use their imagination to express themselves and their understanding of the world. Gym games and activities are often the highlight of the day for our energetic 5/6s. 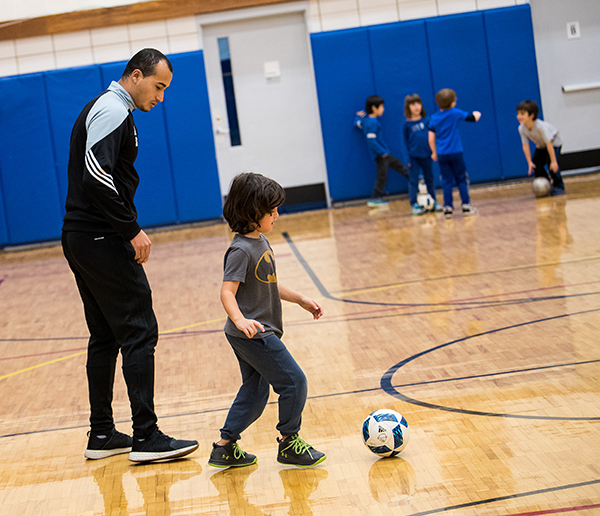 An integral component of our focus on the whole child, our physical education program is designed to promote social and emotional skills, teamwork, and problem-solving. Each season offers a new theme with new skills. The 5/6s participate in engaging games like “Wall Tag” or “Musical Hula Hoops.” Children practice and develop gross motor skills like running, skipping, and galloping through a variety of interactive activities and games. 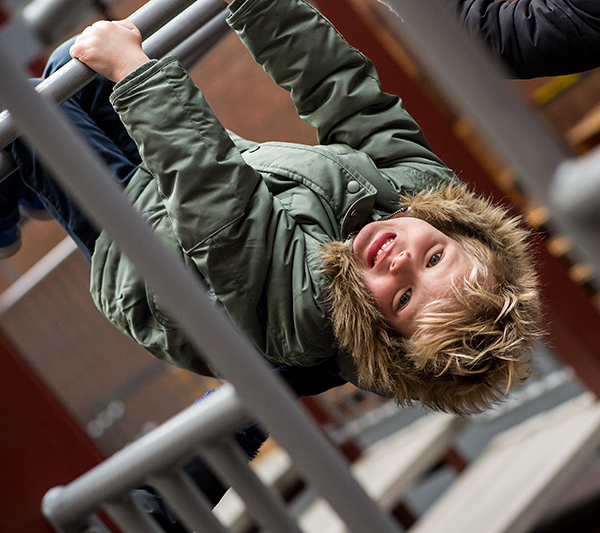 Our facilities include gym equipment like scooters, parachutes, tunnels, and balance beams and always offer children something new and engaging. Class activities are constantly changing according to new skills of focus and, of course, New York City weather. Our gym educators provide opportunities for children to learn a variety of skills in conjunction with our overarching curriculum. In early childhood, social justice lives and breathes in children’s interactions. In the 5/6s, children are developmentally focused on fairness, with regard to peers, the school, and grown-ups. This year, we empower students to be advocates for themselves through discovery of their own identity.